The countryside around Bath is very beautiful. A landscape of low rolling hills and green river valleys begins within a couple of miles of the city centre. If you want to combine city sightseeing with country walks and rural peace, you could opt for a place to stay in the countryside. This way you will be able to unwind and enjoy the views before and after your trips into Bath. Generally, if you want to stay in the countryside and ‘commute’ into Bath for sightseeing, you’ll need a car. You would then need to pay for a car park in Bath, or use the park and ride service. 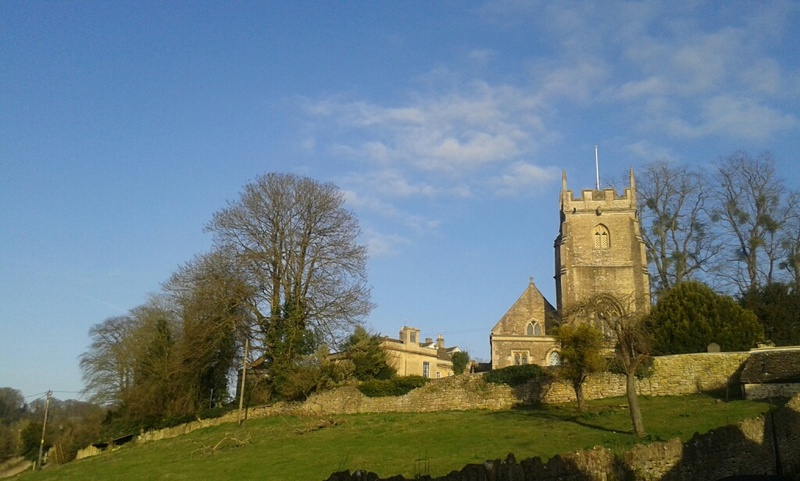 However, there are some villages and countryside locations which are connected to Bath by regular bus or train services, allowing for a relaxing and ‘green’ holiday. 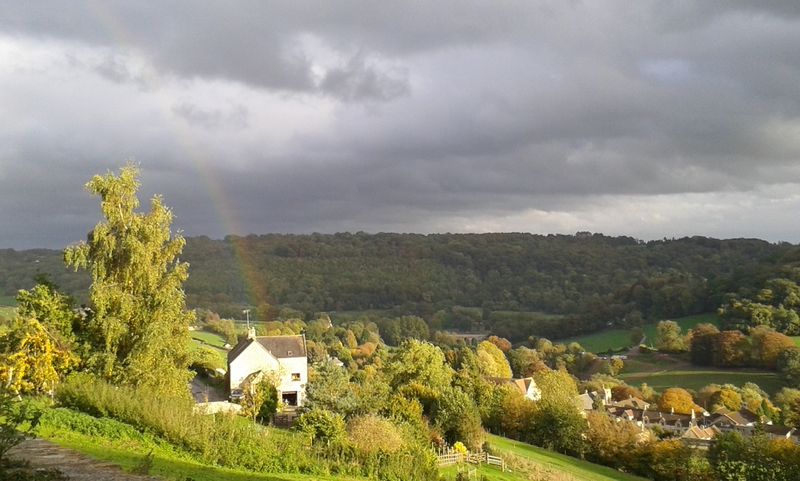 Staying outside Bath is great for a holiday combining walking and culture. With a car, you can explore the surrounding area: the Cotswolds, the pretty green valleys south of Bath and historic towns and villages. The selection of rural retreats here includes village pubs, farmhouse stays, B&Bs and self-catering cottages. Accommodation ranges from informal, family-run places where you might encounter family dogs and cats, to secluded and stylish hideaways. Whether your countryside ideal is pulling on boots and getting muddy, or admiring views as you sip wine on a terrace, you should be able to find the perfect place to stay in the Bath area. The Wheatsheaf, Combe Hay – In a pretty village close to Bath (and very close to the Park and Ride), this historic pub offers stylish accommodation and prides itself on its food and drink, much of it locally-sourced (including wine from Combe Hay vineyard). The Wheelwright’s Arms – This country village pub is only just outside Bath, but is in a lovely rural location. The tiny village of Monkton Combe is in a green valley with footpaths leading into the surrounding countryside and to the canal towpath at Dundas. The pub has been upgraded and given a stylish modern feel. Bus 94 (infrequent) connects Bath and Monkton Combe, and the 265 Bath-Bradford-on-Avon service stops a 12-minute walk away. 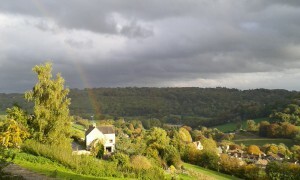 The Westwoods – In Upper Westwood, between Bath and Bradford-on-Avon, this is a comfortable family-run B&B. It’s close to Avoncliff, a picturesque spot with a welcoming pub and a railway station with regular trains into Bath. Toghill House Farm – Surrounded by farmland and animals, this traditional farmhouse B&B is near the village of Wick, convenient for exploring Bath and the Cotswolds. Fishermen’s Retreat and Brooks View Cottage – Self-catering cottages in the green and secret Tucking Mill Valley, south of Bath, close to river meadows, a fishing lake, footpaths and the foot-and-cycle route into Bath through an old railway tunnel. A great location for feeling yourself truly in the depths of the countryside and spotting wildlife – while only a very short distance from Bath. Book well ahead. 189 April Cottage – A pretty cottage B&B close to Bradford-on-Avon. Midway Place – At Farleigh Wick in Wiltshire, this popular B&B has affordable prices and is close to a friendly village pub. Whidlecombe Farm – B&B on a working farm in Priston village, south-west of Bath. Shrubdown – Close to the idyllic village of Freshford, which has a regular train service to Bath, this B&B is convenient for walkers wanting to explore the Limpley Stoke Valley and walk along the Kennet and Avon Canal. The House at Woolverton – A quirky guesthouse with a garden, this combines rural surroundings with the advantage of being on the 267 bus route between Bath and Frome (services approximately hourly Mon-Sat, less often on Sun). Near Norton St Philip. Stowford Mill House – In the countryside a mile from Farleigh Hungerford Castle, this working farm offers B&B accommodation with the chance to consume the farm’s own produce for breakfast. In summer there’s a tearoom on-site. Barn House B&B – In Wiltshire close to the popular and pretty village of Box, this is a countryside B&B with lovely gardens around 15 minutes’ drive from Bath. Beach Hill Cottage – A self-catering studio apartment (sleeps two) in a hamlet near Wick, north-east of Bath. A comfortable place to stay in a rural setting. T’s B&Bs – Bed and breakfast and self-catering rooms in a converted dairy on Lower Rudloe Farm, in a scenic rural location between Box and the little town of Corsham. Visitors can eat the farm’s produce for breakfast, and buy it at the on-site farm shop. Bus 231 runs through Box and Rudloe to Corsham and on to Chippenham. Bath Lodge Castle – A quaint ornamental castle with luxury accommodation, gardens, a hot tub, sauna, woodland walks and its own restaurant, this is a chance to enjoy the Somerset countryside while pampering yourself. > Country house hotels – a selection of elegant options for a grander weekend break.